The retreat offers the opportunity for writers of all genres and levels to work alongside award-winning authors & editors to hone their craft and expand their writing skills, while working on new or existing projects. Our Andalucían writing retreat will take place from July 28-August 5, 2015, and the cost of the workshop is $3950, which includes lodging and breakfast, a tapas tour of Granada, craft of writing seminars, and writing workshops. The retreat will be held at the Hotel Guadalupe (Paseo de la Sabica, 30, 18009 Granada, Spain). Faculty includes Alexander Chee (fiction), Frederick-Douglass Knowles II (poetry, performance), Rita Banerjee (poetry, fiction), and Diana Norma Szokolyai (poetry, nonfiction). In addition to workshops and lessons, participants can opt-in for daily yoga lessons, which help soothe the mind and body by creating opportunities for personal exploration and inspiration. Please note that this yoga/meditation opt-in will only be added to the writing retreat by popular demand (if enough writing retreat participants sign up for it). Taught by CWW’s very talented yoga instructor Elissa Lewis, our yoga classes focus on both the structural and spiritual and can be personalized according to any physical demands you may have. 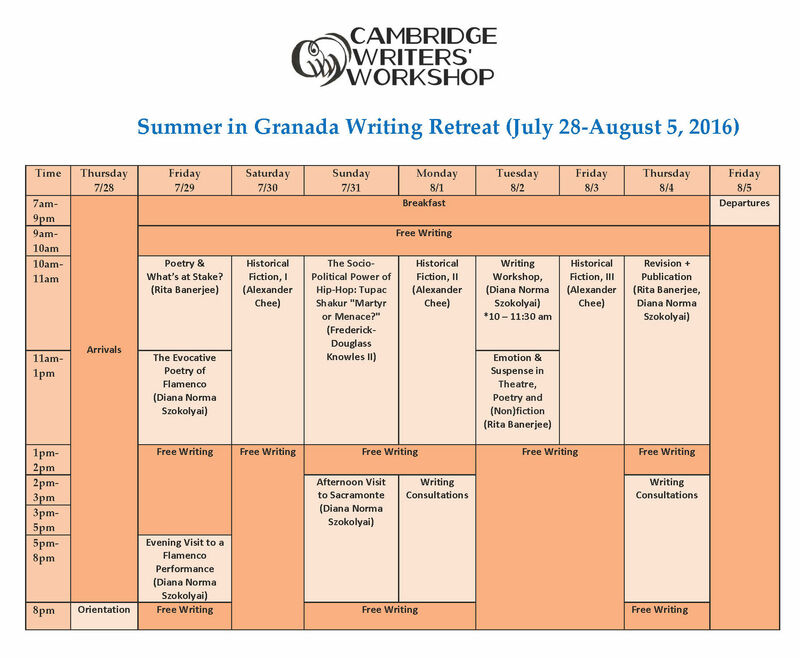 If you’d like to join us in Granada, please apply online at cww.submittable.com by May 30, 2016, and include a $5 application screening fee, along with a writing sample of either five pages of poetry or ten pages of prose. (Due to limited seats, early applications are encouraged, but check for rolling admission after deadline, depending on availability). 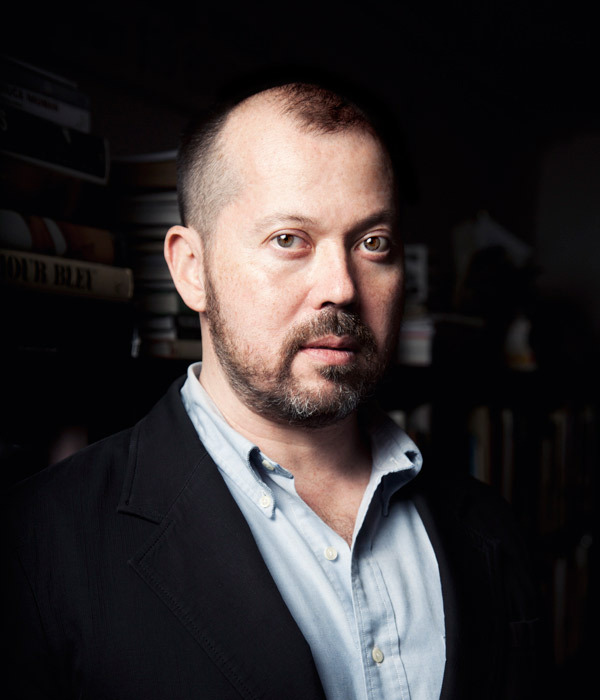 Alexander Chee is the author of the national bestseller, The Queen of the Night, published in February of 2016 by Houghton Mifflin Harcourt. He is also the author of the critically acclaimed novel Edinburgh. He is a contributing editor at The New Republic, an editor at large at VQR and The Lit Hub, and a critic at large for The Los Angeles Times. His essays and stories have appeared in Best American Essays 2016, The New York Times Book Review, Tin House, Slate, Guernica, NPR and Out, among others. He is winner of the Whiting Award, and fellowships from the NEA and the MCCA, and residency fellowships from the MacDowell Colony, the VCCA, Civitella Ranieri and Amtrak. He teaches Creative Writing at Dartmouth College. Frederick-Douglass Knowles II is a poet, educator and activist involved in community education and the performing arts. He has competed on two National Poetry Slam Teams and served as the 2011 Connecticut Slam Team coach. His works have been featured in Poems on the Road to Peace: A Collective Tribute to Dr. King Volume 2, Peabody Museum of Natural History by Yale University Press, The East Haddam Stage Company of Connecticut, The 13th Annual Acacia Group Conference at California State University, Folio –a Southern Connecticut State University literary magazine, Lefoko –a Botswana, Southern Africa Hip-Hop magazine and Fingernails Across the Chalkboard: Poetry and Prose on HIV/AIDS from the Black Diaspora by Third World Press. Frederick-Douglass is currently an Assistant Professor of English at Three Rivers Community College where he infuses English Composition with social injustice. Rita Banerjee is the Creative Director of the Cambridge Writers’ Workshop and the newly appointed Executive Director of Kundiman. She received her doctorate in Comparative Literature from Harvard and her MFA in Creative Writing from the University of Washington, and her writing appears in The Rumpus, Los Angeles Review of Books, Electric Literature, VIDA: Women in Literary Arts, AWP WC&C Quarterly, Queen Mob’s Tea House, Riot Grrrl Magazine, The Fiction Project, Objet d’Art, KBOO Radio’s APA Compass, and elsewhere. Her first collection of poems, Cracklers at Night (Finishing Line Press), received First Honorable Mention for Best Poetry Book of 2011-2012 at the Los Angeles Book Festival, and her novella, A Night with Kali (Spider Road Press), is forthcoming in October 2016. Finalist for the 2015 Red Hen Press Benjamin Saltman Award and the 2016 Aquarius Press Willow Books Literature Award, she is currently working on a novel and book of lyric essays. This class examines the poetry and musical works of the late Tupac Shakur in order to delineate the role of social responsibility in Hip-Hop culture. The class will explore the historical significance of Hip-Hop culture and the social injustices affecting urban youth in the late 20th century. In the midst of social activism for the liberation of urban youth –Shakur’s T.H.U.G. L.I.F.E. philosophy— and his identity struggle as the progeny of a Black Panther Political Party member, in addition to being a young, black male in 20th century America, Shakur’s turbulent, dichotomous lifestyle drove him to a prophetic demise, immersed in a narrative of pseudo-depicted tales of poverty and violence. The class will analyze the life and works of American icon –Tupac Shakur in order to compose poetry that raises awareness surrounding social injustice. In this class, we will explore the fantastically concise and heel-to-floor transmission of passion through the lyrics of flamenco music. Packed with intense rhythms, rhymes, and imagery to match the intensity of the music, flamenco songs are a form of poetry developed by Romani people to express the deepest human experiences of love, death, and oppression. We will examine symbols and structures in the poetry of flamenco, learning the distinctions between siguiriya, tango, playera, soleá, and carcelera. Complementary to the class, we will visit an authentic flamenco performance and get a tour of the Museo Cuevas del Sacromonte, where Romani people have traditionally lived in cave dwellings and practiced the art of flamenco. Once you are accepted into the program, you will need to pay a 30% tuition deposit ($1,185) to hold your seat within 3-5 days of acceptance but not later than April 1, 2016. This amount is non-refundable. The remainder of tuition ($2,765) will be due by April 15, 2016. Our standard and preferred method of payment is PayPal invoice. You can also mail us a check. The deposit is non-refundable. * Are there any scholarships or discounts for the summer program? For writers who have inquired about scholarships and discounts for our summer programs, we are offering the following discount options. This year, writers can also enjoy the full retreat program for $2950 with a shared lodging option. Writers can also attend the program for a retreat & manuscript consultation-only option (with private room) for $2150. Both options include breakfast.